Brad Meester was a second-round pick by Jacksonville in the 2000 NFL Draft. JACKSONVILLE, Fla. (AP) — No suit and tie. No stage and backdrop. No family and friends. Veteran Jacksonville Jaguars center Brad Meester, a blue-collar lineman who spent his entire career trying to avoid the spotlight, announced his retirement in fitting fashion Wednesday. Meester stood by his locker following a morning walkthrough and called it quits after 14 seasons. Meester’s home finale will come Sunday against Tennessee. His final game will be Dec. 29 at Indianapolis, about 360 miles from his home outside Iowa City, Iowa. A second-round draft pick from Northern Iowa in 2000, the 36-year-old Meester played his entire career in Jacksonville. He is the only person to play for every coach in franchise history: Tom Coughlin (2000-02), Jack Del Rio (2003-11), Mike Mularkey (2012) and Gus Bradley (2013). He is one of only five active players who have spent at least 14 seasons with the same team, joining New England quarterback Tom Brady, former Cleveland and current San Francisco place-kicker Phil Dawson, Oakland kicker Sebastian Janikowski and Chicago long-snapper Patrick Mannelly. Meester has started 207 career games, including the last 88. He considered retirement last year, but Bradley and general manager Dave Caldwell talked him into sticking around another season. He seriously thought about playing again in 2014, especially with Caldwell and Bradley in his ear, but decided against it after Sunday’s loss to Buffalo. Meester and his wife, Jamie, have six daughters between the ages of 7 months and 11 years. They have a home on 80 acres outside Iowa City. Meester also has 170 acres in southern Iowa, near Missouri, that he calls his “hunting property.” Meester said he has saved enough money for college and weddings for all six daughters. Meester has personal goals between now and then, too. He wants to work on and build motorcycles after retirement, even planning to attend classes to get certified. And he already has a customer. “I’m going to buy his first bike and never ride it,” running back Maurice Jones-Drew said. “Well, it’s his first one so you know it won’t be his best one,” MJD added. Meester missed just 14 games because of injury over 14 years. He missed four games in 2005 with a torn left biceps, four games in 2007 with a broken ankle and four more in 2008 with a torn right biceps. That stretch had many wondering how much longer he would play. Even the Jaguars brought in several backups to groom as his replacement. Meester outlasted all of them, and coaches and teammates said he’s been playing as well as ever. 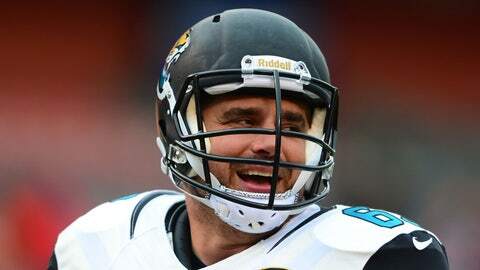 The Jaguars plan to recognize Meester during the home finale. Of course, Meester doesn’t want too much attention — much like the last 14 years.